SiOxNy films with a low nitrogen concentration (< 4%) have been prepared on Si substrates at 400°C by atmospheric-pressure plasma oxidation-nitridation process using O2 and N2 as gaseous precursors diluted in He. Interface properties of SiOxNy films have been investigated by analyzing high-frequency and quasistatic capacitance-voltage characteristics of metal-oxide-semiconductor capacitors. It is found that addition of N into the oxide increases both interface state density (Dit) and positive fixed charge density (Qf). After forming gas anneal, Dit decreases largely with decreasing N2/O2 flow ratio from 1 to 0.01 while the change of Qf is insignificant. These results suggest that low N2/O2 flow ratio is a key parameter to achieve a low Dit and relatively high Qf, which is effective for field effect passivation of n-type Si surfaces. Silicon oxynitride (SiO x N y ) is a very useful material for applications in microelectronic and optoelectronic devices due to the possibility of tailoring the film composition and property according to the O/N ratio. Recently, considerable attention has been focused on SiO x N y for anti-reflection coatings and surface passivation films for thin crystalline Si solar cells [1–3]. It has been reported that SiO x N y films with high positive fixed charge density (Qf) in the range of 1012 cm−2 is effective for field-effect passivation of n-type Si surfaces . So far, several methods have been applied to grow SiO x N y films. For example, high-temperature (>900°C) processes such as the direct thermal oxynitridation of Si in NO or N2O ambient [4, 5] and the annealing of SiO2 in nitrogen-containing ambient [6, 7] have been widely used. However, the high-temperature processes suffer a large thermal budget and a redistribution problem of dopant atoms. Plasma-enhanced chemical vapor deposition (PECVD) process is a low-temperature alternative below 400°C [8–10]. However, the PECVD method needs toxic precursor gases, and it is also noted that the interfacial properties prepared by this method are usually inferior to those of thermal oxides , because the deposition method does not consume the substrate Si unlike thermal oxidation. Moreover, in the films prepared by low-temperature PECVD, the concentration of hydrogen atoms in the form of Si-OH and Si-H bonds is high, which are responsible for poor dielectric properties . Nitridation of silicon oxide in low-pressure nitrogen plasma has also been investigated to fabricate SiO x N y at low temperatures [13, 14]. In the case of low-pressure nitrogen plasma, the ion bombardment of the film surface is a serious problem to develop highly reliable ultra-large-scale integrated circuits . Recently, we have studied the plasma oxidation of Si wafers to grow SiO2 films using atmospheric-pressure (AP) plasma generated by a 150-MHz very-high-frequency (VHF) electric field and demonstrated that high-quality SiO2 films can be obtained using He/O2 or Ar/O2 plasma at 400°C [16, 17]. We have also reported that the AP VHF plasma oxidation process at 400°C is capable of producing material quality of SiO2 films comparable to those of high-temperature (>1,000°C) thermal oxides. 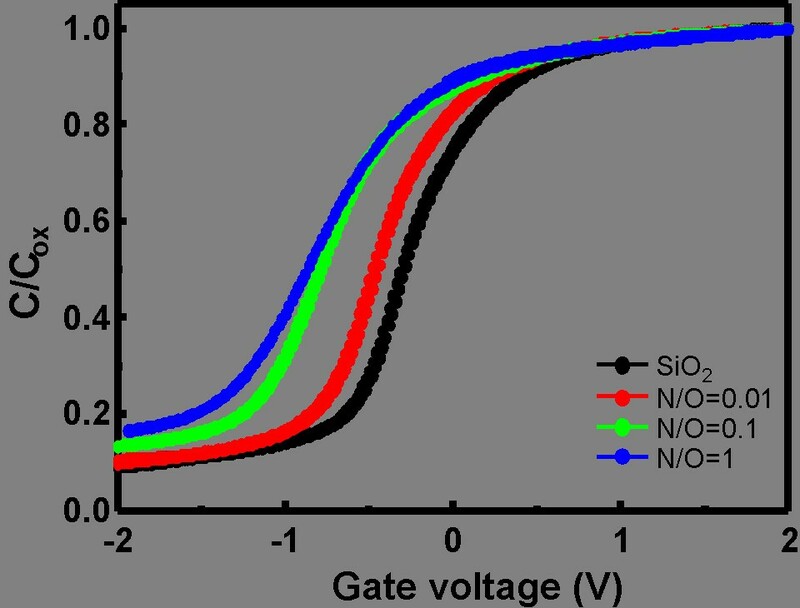 The SiO2/Si structure with low interface state density (Dit) around the midgap of 1.4 × 1010 cm−2 eV−1 and moderately high Qf of 5.3 × 1011 cm−2 has been demonstrated . Therefore, addition of N into the SiO2 film by AP plasma oxidation-nitridation using O2 and N2 precursor gas mixture is an alternative approach for obtaining SiO x N y films at a low temperature of 400°C. The purpose of this work is to present a method for preparing SiO x N y films by AP VHF plasma oxidation-nitridation with a detailed analysis of interface properties of SiO x N y layer by capacitance-voltage (C-V) measurements on metal-SiO x N y -Si capacitors. The details of the AP VHF plasma apparatus have been reported previously . A schematic illustration of an electrode for AP VHF plasma oxidation-nitridation is shown in Figure 1. In the gap between the substrate and parallel-plate electrode, stable plasma is generated at atmospheric pressure with 150-MHz VHF power using a gas mixture of 1% O2/He. N2 gas was simultaneously introduced into the AP VHF plasma with gas flow rates of 1, 10, and 100 sccm. The N2/O2 gas flow ratios were 0.01, 0.1, and 1. The temperature of the Si wafer was fixed at 400°C by monitoring by a thermocouple embedded in the substrate heating stage. The detailed experimental conditions are shown in Table 1. Schematic illustration of the AP VHF plasma oxidation-nitridation apparatus used in this study. The electrode is made of stainless steel plate coated with Al2O3, and its diameter is 50 mm. The substrates used in the present experiments were n-type (001) CZ-Si wafers (4-in. diameter) with a resistivity of 1 to 10 Ω cm. They were cleaned by a room-temperature chemical cleaning method  and were finished by a diluted HF treatment. After AP plasma oxidation-nitridation, some of the samples were subjected to a forming gas anneal (FGA) in 10% H2/He for 30 min at 400°C. In order to investigate Qf and Dit of the SiO x N y film, Al/SiO x N y /Si metal-oxide-semiconductor (MOS) capacitors were fabricated with 0.5-mm-diameter Al pads by vacuum deposition. A back contacting electrode at the rear Si surface was also made by Al deposition. The thickness of the SiO x N y layer was determined by ellipsometry (Rudolph Auto EL III) with a wavelength of 632.8 nm. The chemical bonding in the material was investigated by Fourier transform infrared absorption (FTIR) spectrometry (Shimadzu FTIR–8600PC) in the wave number range of 400 to 4,000 cm−1. X-ray photoelectron spectroscopy (XPS; ULVAC-PHI Quantum 2000) was used to investigate the depth profile of atomic composition and bonding of atoms in SiO x N y films. High-frequency (HF) and quasistatic (QS) C-V measurements were performed using a 1-MHz C meter/CV plotter (HP 4280A) and quasistatic CV meter (Keithley 595), respectively. Thicknesses of films prepared at 400°C for 9 min under N2/O2 flow ratios of 0.01, 0.1, and 1 were 20.8, 19.5, and 18.9 nm, respectively. (The film thickness was a mean value for measurements of eight different sites on the sample.) Since the difference in the film thickness is small (<±5%), its effect on the interface state properties may be negligible. Figure 2 shows FTIR spectra of the films prepared at 400°C for 9 min under different N2/O2 flow ratios. The dotted lines in Figure 2 indicate the stretching and bending vibration modes of Si-O-Si bonds at the wave numbers of 1,075 and 810 cm−1, respectively. Almost no apparent peak for Si-N stretching mode at 835 cm−1 is observed , which may be related with the larger dissociation energy of N2 than that of O2 molecules. IR spectra of films prepared by AP VHF plasma oxidation-nitridation under different N 2 /O 2 flow ratios. In Figure 2, the strongest peak in IR spectra corresponds to Si-O-Si stretching mode, indicating that the film consists predominantly of SiO2. The dielectric constant of the film was calculated using the maximum accumulation capacitance obtained by C-V curves. The result showed that the dielectric constant was fairly uniform over the sample area with a variation of about 2% and that the average dielectric constants of the films were 4.26 and 4.01 for N2/O2 flow ratios of 0.01 and 1, respectively. Since the dielectric constants of SiO2 and Si3N4 are 3.9 and 7.5, respectively, nitrogen atoms are considered to be incorporated in the SiO2 structure. XPS spectra in the Si 2p region for the SiO x N y layer formed at 400°C for 9 min with a N2/O2 gas flow ratio of 0.1 are shown in Figure 3. The Si 2p peak observed at 99.7 eV is from the Si substrate and the one at 103.5 eV from Si-O-Si bonding. On the as-grown sample, as shown in Figure 3a, after five times of surface layer sputtering by 10-keV Ar ions (duration of one sputtering is 10 s), Si-O-Si bonding peak is strong, but a small peak from the Si substrate is also seen. By the sixth and seventh sputtering, the Si-O-Si peak decreases and the bulk Si peak increases. It is noteworthy that Si-N bonding at 102.4 eV is also detected. Since the Si-N peak becomes clear before the Si-O-Si peak vanishes, Si-N bonding is supposed to be located at the SiO2/Si interface region. In the annealed sample, as shown in Figure 3b, the decrease of the Si-O-Si peak after the sixth sputtering is not significant as compared to that in the as-grown sample and the Si-O-Si peak still remains after the seventh sputtering. The Si-N peak becomes well observable after the seventh sputtering in the annealed sample instead of the sixth sputtering for the as-grown case. However, the tendency of decreasing Si-O-Si peak and increasing bulk Si peak with increasing sputtering time is the same for both as-grown and annealed samples. These results can be understood by considering the increase in SiO2 thickness by the annealing and the presence of Si-N bonding at the SiO2/Si interface region. The thickness increase in the annealed SiO2 sample is considered to be due to the density relaxation of SiO2 by the thermal annealing [20, 21]. XPS spectra in Si 2 p region for SiO x N y layer formed by 1% O 2 /He AP plasma oxidation-nitridation. The process is at 400°C for 9 min with a N2/O2 gas flow ratio of 0.1. (a) As-grown sample. (b) Annealed sample. Figure 4 shows depth profiles of Si, O, and N atom concentrations in SiO x N y films measured by XPS as a function of sputtering time, which reveals that incorporated N atoms (approximately 4%) locate at the film/substrate interface for all the samples. These results are similar to those by the high-temperature process, such as the direct thermal oxynitridation of Si in N2O ambient at 1,000°C . According to the thermodynamics of Si-N-O system, nitrogen in bulk SiO2 is not thermodynamically stable but may be stable at the interface ; therefore, it has been assumed that nitrogen incorporated into the film during oxynitridation (especially in high-temperature N2O or NO process) reacts only with Si-Si bonds at or near the interface, not with Si-O bonds in the bulk of the SiO2 overlayer. Similarly, we suppose that since the dissociation of nitrogen molecules is not significant in the present case, nitrogen migrates to the Si/SiO2 interface during AP plasma oxidation-nitridation. 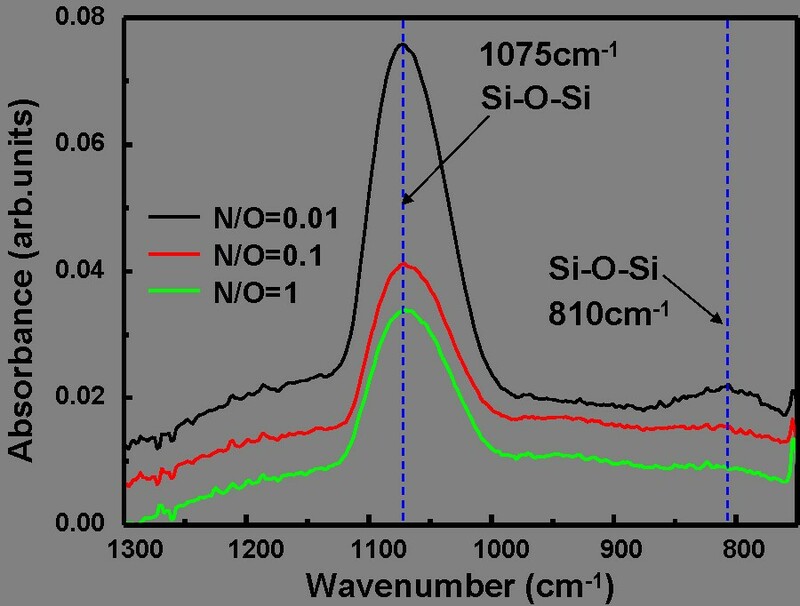 XPS depth profiles of Si, O, and N concentrations in SiO x N y layers. The layers were prepared by AP VHF plasma oxidation-nitridation process under different N2/O2 flow ratios. Finally, the interface electrical quality of SiO x N y layers prepared by AP VHF plasma oxidation-nitridation process has been investigated. Figure 5 shows typical HF C-V curves of the MOS capacitors utilizing SiO x N y layers formed by various N2/O2 flow ratios. 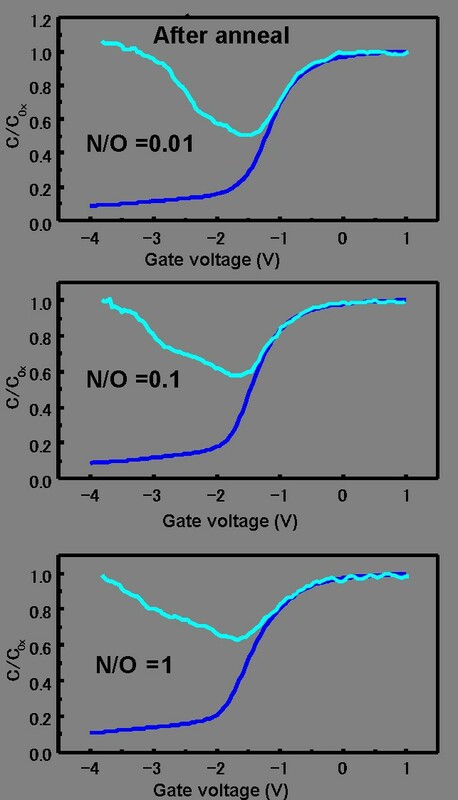 The HF C-V curve shifts to a negative gate bias direction with increasing N2/O2 flow ratios, which shows an increase in positive Qf with incorporation of more N atoms into the SiO2 film (Figure 4). The values of Qf have been estimated by flat-band voltage shift to be 5.1× 1011, 8.1× 1011, and 8.4 × 1011 cm−2 for N2/O2 flow ratios of 0.01, 0.1, and 1, respectively. Typical HF C – V curves for Al/SiO x N y /Si capacitors utilizing SiO x N y layers prepared by different N 2 /O 2 flow ratios. 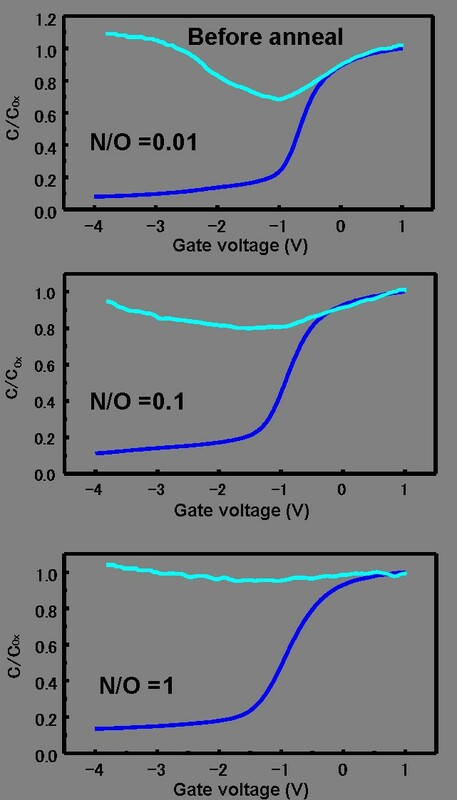 The C–V curve shifts to a negative gate bias direction with increasing N2/O2 ratio. The HF (blue) and QS (cyan) C-V curves for Al/SiO x N y /Si MOS capacitors before and after FGA are shown in Figures 6 and 7, respectively. The annealed Al/SiO x N y /Si MOS capacitors show better interface properties compared with those without FGA. Dit after FGA were 6.1 × 1011, 1.2 × 1012, and 2.3 × 1012 cm−2 eV−1 for N2/O2 flow ratios of 0.01, 0.1, and 1, respectively. 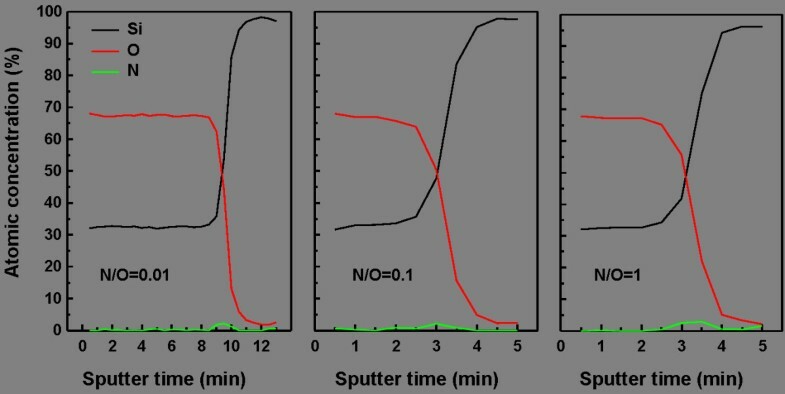 It is well known that an introduction of a small amount of nitrogen into the SiO2 gate oxide leads to an enhanced defect density in the case of N pileup at the Si/SiO2 interface . From our XPS results, when the N2/O2 gas flow ratio increases, the more N atoms pileup at the Si/SiO2 interface during AP plasma oxidation-nitridation; therefore, Dit increases largely with increasing N2/O2 flow ratio from 0.01 to 1. The corresponding values of Qf were 1.2 × 1012, 1.4 × 1012, and 1.5 × 1012 cm−2, respectively. It is noted that Dit decreases largely with decreasing N2/O2 flow ratio from 1 to 0.01, while the decrease of Qf is insignificant. These results suggest that a significantly low N2/O2 flow ratio is a key parameter to achieve a small Dit and relatively large Qf, which is effective for field-effect passivation of n-type Si surfaces. HF and QS C - V curves for Al/SiO x N y /Si MOS capacitors (before annealing) utilizing SiO x N y layers. The layers were prepared under N2/O2 gas flow ratios of 0.01, 0.1, and 1. HF and QS C - V curves for Al/SiO x N y /Si MOS capacitors (after annealing) utilizing SiO x N y layers. The layers were prepared under N2/O2 gas flow ratios of 0.01, 0.1, and 1. SiO x N y films with a low nitrogen concentration (approximately 4%) have been prepared on n-type (001) Si wafers at 400°C for 9 min by oxidation-nitridation process in AP plasma using O2 and N2 diluted in He gas. Interface properties of SiO x N y films have been investigated by C-V measurements, and it is found that addition of N into the oxide increases both the values of Dit and Qf. After FGA, Dit at midgap decreases from 2.3 × 1012 to 6.1 × 1011 cm−2 eV−1 with decreasing N2/O2 flow ratio from 1 to 0.01, while the decrease of Qf is insignificant from 1.5 × 1012 to 1.2 × 1012 cm−2. These results suggest that a low N2/O2 flow ratio is a key parameter to achieve a low Dit and relatively high Qf, which is useful to realize an effective field-effect passivation of n-type Si surfaces. This work was supported in part by Grants-in-Aid for Scientific Research (no. 21656039, no. 22246017, and Global COE Program (H08)) from the Ministry of Education, Culture, Sports, Science and Technology, Japan. The authors would like to thank A. Takeuchi of Osaka University for his technical assistance. ZZ helped in the oxidation-nitridation experiments and sample characterization, and wrote the manuscript. YS and YK performed the atmospheric-pressure plasma oxidation-nitridation of Si wafers and XPS, FTIR, and C-V measurements. TY, HO, and HK helped in designing the work. KY discussed the results and proofread the manuscript. All authors read and approved the final manuscript.